While many of our customers have the need for a spreader beam, many have avoided them for a couple of reasons. 1) Spreader beams are heavy and not easy to handle or transport and, 2) Spreader beams tend to be expensive, especially once you factor in shipping. Well, Caldwell has changed the game! Their new line of Dura-Lite #430 Composite Spreader Beams are lightweight, easily handled by just 1 or 2 men, and every beam shown here SHIPS FREE in the US48. 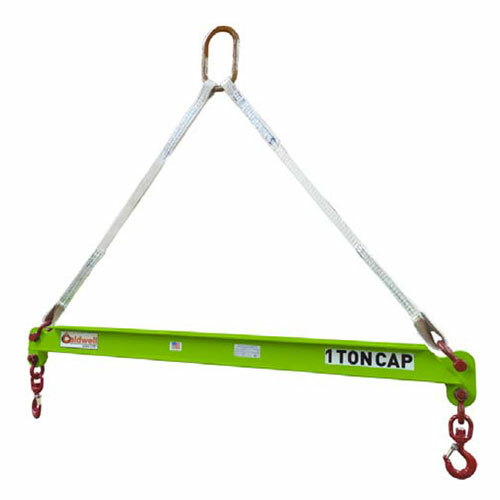 They are made from durable composite materials that are bonded together to form ultra-strong lifting beams. Due to their composite construction, these beams are non-conductive and corrosion-resistant as well. Despite their lightweight and affordable design, Dura-Lite beams are rugged and built to hold up in tough environments. Compliant with ASME B30.20, Design Category B, Service Class 4.